It's been a little rainy and gloomy where I live for the past couple days - a slap-in-the-face reminder that summer is coming to a close. I wanted to squeeze in a few more summery manis while I could. I did Essie Geranium for a few days (posted a long time ago here) and then Essie Super Bossa Nova. OK, I'll be straight with y'all. This polish isn't really for me. It is pretty, application was great, but I'm just not feeling it. I think it's just got too much going on for me. I'm a creme girl, and when I do a bit of shimmer or something special, I usually prefer it to take center stage as part of a more neutral polish. The bright colour + texture combo is a little OTT for me in this particular case. However, I do think it would look really really fab on toes! What is your final summer mani going to be? Any last minute recs for me? I like this shade but admit only wore it 2x...I have a major thing for fuchsia/magenta shades. This one just misses the mark on formula for me. It's not enough glass fleck to be big in my book for that finish...it's not got enough purple duochrome to it as others I have do. My 2 favs in this range are both OPI's - Pompeii Purple and Flashbulb Fuchsia. I wore PP for enons and 2 yrs ago changed to FF as my go to fav shade in this range because it's more modern and really gives out a get color. I agree with the other commenter that this is like Tour DE Finance - or rather Tour is like this one as this came first. Would love, love to see you feature OPI's Flashbulb Fuchsia...it's so wearable for so many folks - a great change from summer neons and all the various colors of the rainbow now sported on nails - but never boring. Oh and sooo wishing we had rain where I live this time of yr...we are just getting into what is the hottest part of summmer that always hits right after Labor Day and the local college starts back up again. Never seems like fall gets here 'cause of that...we go pouf from that to 1 more week of crops/shorts into winter always seems...so when I hear rain and feel of fall coming from others I miss when I lived in VT a whole lot. Not complaining about living on the beach where I do however - just wish more rain & more fall. @screamviolence - You're right it does look like Tour de Finance! (I don't have that one...) And thanks I will look into Strawberry Margarita! I've heard that one raved about many times! 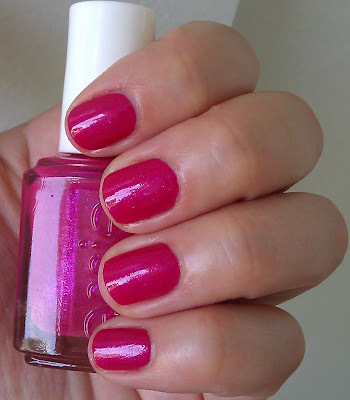 @beachgal - I don't own Flashbulb Fuchsia, but it sounds like maybe I should! Thanks for the rec friend :) And you can have my rain - it's like a monsoon every other day out here. I actually thought the Bossa Nova looked really good, however, I do really like Scarlett o'Hara as my all time fave feisty essie red.